With the upcoming Thanksgiving Day celebration comes the anticipation of heaping plates and the un-looping of belts. We gather together to show thanks for our bountiful lives no matter what the measure… until the next day when we can’t fit into our favorite pants because we’re still digesting our bounty-FULL dinners. We’re all a victim to the old standard “eyes bigger than stomachs” routine, and gladly so. 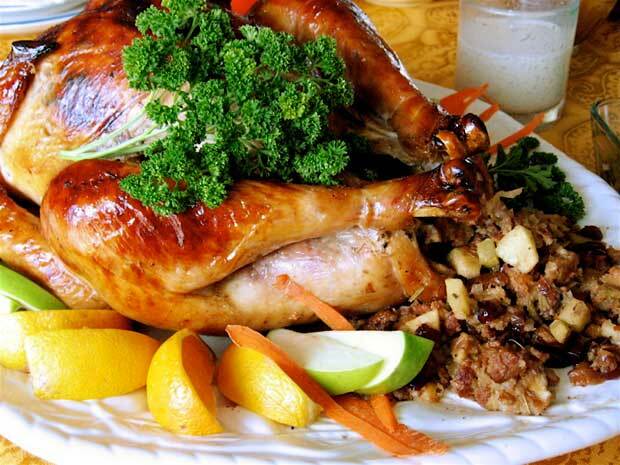 I love this recipe, found at The O’Mama Report website, as it incorporates part of Thanksgiving dinner later…. 1. Juice the squash (page 00), reserving the pulp. You should have 1/4 cup pulp and 1/2 cup juice. Put the squash pulp in a mixing bowl and sprinkle with the flour. Using your fingertips, gently squeeze the pulp and cake flour together until they are just blended. Add the apple juice and 1/4 cup of the squash juice, and stir gently until blended. 2. In a large bowl, beat the egg whites until soft peaks form. Add the 1 to 2 teaspoons syrup and beat until stiff glossy peaks form. Stir one-third of the egg whites into the squash batter. Season with salt and pepper. Gently fold the lightened batter into the egg whites. Be careful not to blend the mixture completely. The more gently you treat the egg whites, the higher the pancakes will rise. You should have about 2 1/3 cups of batter. 3. Heat a large non stick sauté pan, skillet, or griddle over medium heat. Rub the oil over the surface of the hot pan with a paper towel. Ladle about 1/4 cup of the batter into the pan and cook for about 4 minutes, or until just set. Using an oiled thin-bladed metal spatula, very gently turn the pancake over and cook for 1 1/2 to 2 minutes, or until done. The pancakes will be very soft and light. 4. As it sits, the batter will separate. Stir or fold it gently before cooking the rest of the pancakes. Serve the pancakes overlapped on heated plates and drizzled with syrup. Mash the banana with a fork in a bowl until very smooth. Add the coconut meal and some cinnamon to taste. Mix well. Leaf out in direct sunlight for about 1 hour, flip over and leaf for another hour. You may also use the dehydrator or oven. But then it will take longer to dry them. They don’t have to be dry, just on the outsides. They’re so good anyway that they’re usually gone before I want to serve them. If you make them the night before, you can take them to go for breakfast in the morning. Put all ingredients in a high speed blender. Add enough water so that all ingredients are covered. Blend well. You may want to add a little more water if it’s too thick. You may blend longer if you find it too cold. The hemp seeds provide good fats and super protein. Hemp seeds are the only seeds that have no enzyme inhibitor and therefore don’t have to be soaked in water before eating. Peal the apples and take out the core. Take the avocado meat out of the avocado. Put the two ingredients in a bowl. Mix well with a hand mixer. This is another very simple raw food recipe. Enjoy and Happy Thanksgiving! For we all have truly wonderful blessings to be thankful for!